What does a national public health strategy for ASGM look like? Is Borax the Miracle Chemical that Will Replace Mercury in Artisanal Gold Mining? All rocks are made up of one or more minerals. Gold, while also a native element, is one such mineral. Therefore, a given rock may contain gold within its mineral mixture. But how does it get there? It starts deep in the earth. Far below the earth’s surface, where temperature and pressure are high, gold and other minerals become dissolved in hot salty water and can travel through cracks in the earth’s crust. When the water reaches a place that is colder and under less pressure, the gold and other minerals harden, turning into solid rock. This new rock, or mineral deposit, is made of many different minerals, including gold, that are fused together. Gold may travel in a similar manner when mixed with molten rock (magma fluids) and is deposited when the magma penetrates upwards and cools. Because these gold-bearing rocks form in cracks, they are shaped like veins and are called “gold-bearing veins”. When gold-bearing veins are eroded by natural forces such as tectonic movement and river flow, the gold-bearing rock is broken down into smaller pieces, transported over a distance, and deposited in rivers and estuaries. These deposits are called “alluvial deposits” and can be found along present-day waterways, or in strata containing the deposits of ancient waterways. What are the properties and uses of gold? Of all the minerals mined from the Earth, none is more useful than gold. Its usefulness is derived from a diversity of special properties. Gold conducts electricity, does not tarnish, is very easy to work, can be drawn into wire, can be hammered into thin sheets, alloys with many other metals, can be melted and cast into highly detailed shapes, has a wonderful color and a brilliant luster. Gold is used for fillings, crowns, bridges and orthodontic appliances. It is a bio-compatible metal, meaning it can be placed in contact with a person’s body and not cause harm to one’s health. It is a highly efficient conductor of electricity and is used in most electronic devices, including cell phones. Gold contained in connectors, switches and relay contacts allows phones to remain free of corrosion. According to the World Gold Council, a single mobile device contains up to 50 milligrams of gold. That’s a tiny amount but nearly 1 billion cell phones are produced each year. With a gold value of about 50 cents in each phone, that adds up to $500 million dollars in gold each year! Gold can also be found in most standard desktop and laptop computers. It is used in a CPU’s memory chip and motherboard, allowing parts of your computer to receive power and communicate with each other. Gold acts as a reliable conductor, allowing for the rapid and accurate transmission of digital data from one device to another. In fact, only silver and copper are better conductors of electricity. Gold is highly malleable, flexible, and can be beaten into thin sheets, only a few millionths of an inch thick. Space vehicles are fitted with a gold-coated polyester film to reflect infrared radiation and to help stabilize core temperatures. Without gold, darker colored parts of spacecraft would absorb significant amounts of heat. NASA also protects its astronauts using gold. Astronauts’ helmets are covered by the extravehicular visor assembly. The visor is coated with a thin layer of gold to filter out the sun’s harmful rays. What is Artisanal and Small-Scale Gold Mining (ASGM)? Artisanal and Small-scale Gold Mining (ASGM) is the production of gold-bearing mineral resources using largely manual and semi-mechanized techniques, by individuals, groups or communities. Gold-bearing ore is extracted from the earth and processed via one of many manual or semi-mechanical techniques to produce gold, which is then converted to currency through a sale. ASGM is different than large-scale mining (LSM). LSM produces gold on a much larger scale using fully mechanized extraction and processing techniques. An important difference between the two sectors is that ASGM transfers wealth more directly and to larger populations of local workers in rural parts of developing countries. There is a significant and growing interaction between the formal mining industry and ASGM. Both conflict and cooperation with formal mining operations have been growing in many countries. ASGM is a major gold producer and the world’s largest employer in gold mining. The ASGM sector is responsible for 20% of the annual gold production globally (approx. 400 tonnes) emerging from over 80 nations and representing 90% of the global gold mining workforce. ASGM may be formal or informal depending on the laws of each country, and the ability and desire of miners to adhere to these laws. However, ASGM is recognized by many countries and the World Bank as a poverty relief mechanism and an important opportunity for development. Record gold prices create the potential for new wealth to enter impoverished communities that have failed to attract other industries. Incomes in ASGM are often 2-4 times those typically found in agrarian economies. At 1600 USD/oz., ASGM gold production has a gross value of around 20.5 billion dollars; this equates to about 2000 USD/miner per year. The secondary economy of ASGM, using a multiplier of 5, is around 100 billion USD and involves 50 to 100 million people. At a normalized wealth level (purchasing power parity: PPP), this is roughly 40 times poorer than the average US citizen. How do artisanal and small-scale miners use chemicals to extract gold? Mining methods vary according to the geology of the area. The gold found in riverbeds is easier to extract from the surface without chemicals using just basic tools, river terraces, or digging pits. Hard-rock mining underground extracts ore which is processed on the surface to extract the gold. Most commonly, it is mixed with mercury, which captures the gold to form a mixture known as amalgam. The amalgam is then heated which evaporates the mercury, leaving residual gold and other metals. Some small-scale miners use cyanide as an alternative to mercury. Cyanide leaches the gold from the crushed ore, dissolving it in the water. As this process requires substantial investment, special training, a longer processing time, and significant financial capacity, it is less widely used by ASM miners. However, when used properly, cyanide enables miners to eliminate mercury completely and increase gold recovery rates. What are the problems associated with the ASGM sector? Artisanal and Small-Scale Gold Mining (ASGM) in developing countries is the largest remaining intentional use of mercury in the world. In contrast to other industrial uses, all of the mercury used in ASGM is released directly into the environment. As a result, worldwide ASGM is second only to the burning of coal (primarily in coal-fired power plants) as a source of mercury to the atmosphere. Mercury use in ASGM is estimated to be 1608 tonnes per year in 2013 (GMA 2013). Mercury is a naturally occurring element that is highly toxic. Mercury vapour causes damages to the nervous system, kidneys, causes insomnia, tremors, depression, and gum disease. Once released into the atmosphere, mercury can travel long distances, polluting lakes and streams. As a result of human activities, mercury levels in many fish species around the world have risen to the point of being unsafe for those who rely on fish as a regular part of their diet. Its most toxic form – methylmercury – accumulates in large predatory fish and is taken up in our bodies through eating fish, with the worst impacts on babies in utero and small children. Mercury inhalation is threatening to small children, child in utero, pregnant women, women of childbearing age. It is passed on from the mother to the child and fetuses. Children are most susceptible to developmental effects from mercury exposure. Mercury is used in ASGM to concentrate gold by forming a mercury-gold amalgam. Heating the amalgam then evaporates the mercury leaving only the gold. During the heating of the amalgam, mercury vapour is released, directly exposing miners and their communities. In addition, the disposal of contaminated tailings results in the release of mercury into local soil and waterways, where it can remain for centuries. Other problems associated with the ASGM sector include silica dust exposure, child labour, prostitution, criminal activity, lack of transparency in supply chains, and the fact that small-scale miners are at the end of long and complex supply chains. 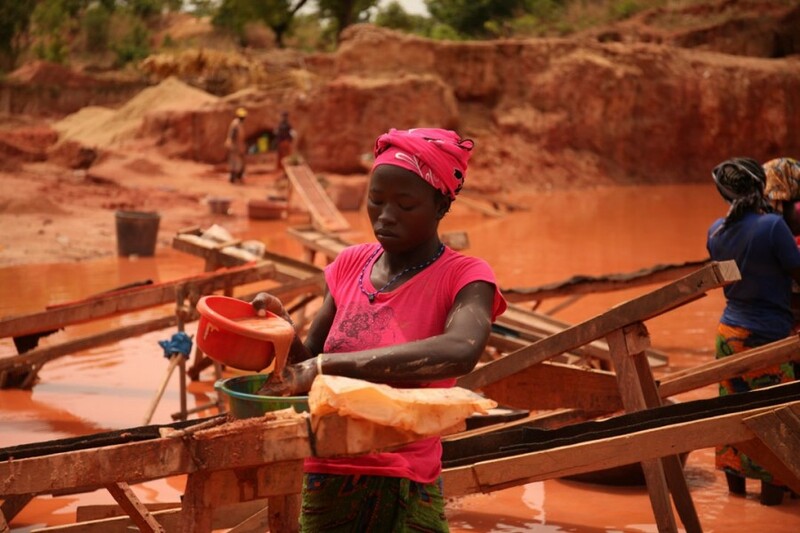 Why do artisanal and small-scale gold miners use mercury? Mercury is currently favored by miners over other methods of gold extraction because it is inexpensive, accessible, simple to use, and allows miners to produce gold quickly, often in a single day. Mercury use enables miners to work independently and gain rapid access to this new source of wealth. Mercury pollution problems are generally caused by socio-economic barriers to the adoption of better practices. What is the largely untold story of ASGM? The ASGM sector represents the first-rate mechanism of direct transfer of wealth from rich to poor populations with an amplification effect extending to the secondary economy including agricultural producers, merchants, traders, and service providers. The sector represents a huge source of rural employment and wealth, with gold profits circulating and building a more diverse local economy. The ASGM sector provides a primary income for 10 to 20 million miners in over 80 countries, including approximately 3 million women and children. The sector also indirectly supports 50 to 100 million people worldwide (Pollution Probe, 2003). ASGM is a major gold producer and the world’s largest employer in gold mining, representing around 15% to 20% of gold supply (around 400 tonnes) and 90% of the gold mining workforce worldwide. At 1600 USD/oz, ASGM gold production has a gross value of around 20.5 billion dollars; this equates to about 2000 USD/miner per year. The secondary economy of ASGM, using a multiplier of 5, is around 100 billion USD and involves 50 to 100 million people. At a normalized wealth level (purchasing power parity: PPP), this is roughly 40 times poorer than the average US citizen. There is a significant and growing interaction between the formal mining industry and ASGM. Both conflict and cooperation with formal mining operations have been growing in many countries. Why can’t we just eliminate ASGM all together and get artisanal miners to find another way of life? If artisanal and small-scale mining is carried out in a responsible manner, it can be both socially and environmentally sustainable. Most artisanal and small-scale miners have no available alternatives. Mining, which is extremely hard work, provides their only possible income and is their best option to make a living. Furthermore, ASGM has great potential to create sustainable economic development in communities otherwise often trapped in poverty. What changes are being made within the industry to ensure small-scale miners are not using mercury when mining? The biggest development to change the practice of using mercury to mine gold is the Minamata Convention on Mercury – a UN Environment environmental treaty signed by the world’s governments. Under the Minamata Convention, countries have agreed to introduce mercury-free technology to assist artisanal and small-scale miners to use alternative and more profitable techniques. This serves the double purpose of eliminating mercury pollution while still providing what is broadly recognized by world bodies as an important livelihood supporting around 100 million poor people in more than 80 countries. What is the Minamata Convention on Mercury? The Minamata Convention on Mercury is a global treaty to protect human health and the environment from the adverse effects of mercury. It was adopted on 10 October 2013 and entered into force on 16 August 2017. The first Conference of the Parties took place from 24 to 29 September 2017 in Geneva, Switzerland. This instrument commits governments to reduce risks to human health and the environment from mercury pollution, through reducing the demand and releases of mercury from all sources, including ASGM. Major highlights of the Minamata Convention include a ban on new mercury mines, the phase-out of existing ones, the phase-out and phase down of mercury use in a number of products and processes, control measures on emissions to air and on releases to land and water, and the regulation of the informal sector of artisanal and small-scale gold mining. What work do you do at the Artisanal Gold Council? The Artisanal Gold Council (AGC) is a not-for-profit organization based out of Victoria, BC, Canada. We are global experts leading the transformation to an environmentally sound, socially responsible, and formalized artisanal gold mining sector. Our global team has extensive field knowledge and direct experience with ASGM communities worldwide. We have decades of experience in the areas of business, sustainable development, social responsibility, governance, environment, health, geology, geospatial analysis, gold markets, and mercury science. We work with miners, government, and industry. Our diversity is our strength. What is Artisanal Gold Council’s approach? The AGC’s mission is to improve the environmental and socio-economic conditions of the world’s artisanal gold miners. We work directly with ASGM communities and local experts to develop integrated and practical solutions that address the unique circumstances that exist in different locations around the world. We aim to improve the ASGM sector through awareness, training, education, and capacity-building. The diversity of our work and our grass-roots approach allow us to effectively bridge field work with national and international policy. We do this by engaging directly in the field with miners, by working with governments to help them comprehend the opportunity that the sector represents and to deliver the assistance needed to help them transition to the formal economy. We also work with gold markets, particularly the socially responsible investment market to help bring the capital needed by miners to improve their practices as they are grossly underfunded compared to industrial or large-scale mining enterprises. To improve the ASGM sector worldwide and have a positive impact on the millions of people involved in this sector in more than 80 countries, we use our deep field knowledge and focus on the following strategic areas: Improved practices, Governance, Livelihoods, Health, Environment, Gender equality, Market access and development. Our integrated approach seeks to build an environmentally sound, socially responsible, and formalized ASGM sector effective at transferring wealth from rich to poor. What solutions and services do you offer? We work with governments globally to develop strategies to promote the reduction of emissions and releases to the environment of mercury as part of the Minamata Convention commitments. We generate business models for miners and work with gold buyers to help them source responsibly mined artisanal gold for the international market. What is responsible artisanal gold? While there are many definitions based on different corporate policies and standards, there are a few key benchmarks. For example, many in the jewelry sector look to guidance or standards issued by the Organization for Economic Cooperation and Development (OECD), London Bullion Market Association (LBMA), and Responsible Jewellery Council (RJC). These frameworks illustrate that “responsibility” requires due diligence and verification to ensure that mineral production and trade does not support armed groups or corrupt practices and that it takes place in conditions free of forced labor and the worst forms of child labor. Environmental performance expectations vary, but there is often an expectation for progressive improvement toward reduction and responsible use if not elimination of mercury use, as laid out in the Minamata Convention. Why should I buy mercury-free gold jewellery? Mercury is a global pollutant. It travels through the atmosphere around the world and contaminates fish globally so everyone is affected. By buying mercury-free gold in jewellery, consumers are doing their part in reducing mercury pollution and directly reducing their own exposure to mercury. Why does responsible artisanal gold represent an opportunity for the ASGM sector? The consumer is becoming more aware and responsible. As an example, 30 to 40% of the US consumers are sensitive to responsible & respectful products. Consumers require a traced product, socially and environmentally responsible produced and manufactured by good governance organizations. Accountability and traceability will be of the essence in ASGM. Why should I consider buying responsible artisanally-mined gold? There may be commercial reasons, such as securing diverse and new sources of supply and responding to increasing consumer interest in materials and products that benefit producer communities. Companies sourcing ASM gold and carrying out adequate due diligence also help drive positive change in global supply chains. In producing countries, responsible production and sourcing of ASM gold have the potential to foster sustainable economic development in mining communities, increase public revenues, reduce the share of gold that finances conflict, human rights abuses and illicit activities of armed groups, criminal and terrorist organizations, and promote broad-based development. Why investing in the artisanal and small-scale gold mining sector? Creating shared value: Investing in the Responsible Artisanal Gold™ Fund allows companies and individuals the opportunity to build social value into their investment strategy. It supports the ethical evolution of the gold industry. What is the case for investment in artisanal gold? Artisanal gold exploration and production are seen as “frontier” investments due to the risk profile, location, and often a dearth of information about operations and a dearth of significant case studies. But this is changing. With appropriate due diligence and risk characterization, the artisanal gold sector has a number of unique characteristics that make it attractive for investment. Consumers seek responsible jewelry and other products, while refiners, manufacturers, and retailers seek corporate social responsibility values, B2B relationships, and customer interest, and/or marketing opportunities. The ASGM sector is being de-risked by international and national policy frameworks, conventions, standards, practices, capacity building initiatives, and other types of public and private engagement. Artisanal gold is currently being produced, and investment in artisanal gold production improvements will nearly always result in increased recovery and higher production of gold. Investment in relatively simple technologies can increase recoveries typically by 30% over existing operations, buffering other potential financial risks such as variable world gold price, and also significantly improve the environmental performance of the operation. Risks associated with the social license to operate – an increasing challenge for large-scale mining – can be significantly lower for artisanal mining, as much of the workforce may come from the community. Investors can generate a clear and measurable social impact because of their investment, along with a quick repayment period typically much shorter than the traditional discovery to production cycle of the formal industry. Capital additions immediately yield production efficiencies as well as improved environmental and social performance, translating into real health, social, and economic benefits for miners, their communities, and their ecosystems – locally and globally. What roles can donors play? The international donor community is an important partner in supporting improvements to the ASGM sector. Government agency donors have contributed development, capacity building and technical assistance, and other funds for projects in and around ASGM operations and communities, and to formalize and improve ASGM supply chains and market access. Other donors include multilateral development and financial institutions such as the World Bank and other development banks, which provide support to governments in ASGM-producing countries, and the Global Environment Facility, which serves as the financial mechanism for the Minamata Convention on Mercury. Donors share an interest in private sector engagement in artisanal mining operations as a means of building on their past funding and enabling a scale of implementation beyond the means of public sector financing. Private sector investments may also be more nimble in responding to opportunities that arise outside of donor budget cycles and funding decision schedules. Investors see value in continued engagement of donors in ASGM projects for a number of reasons, including initial financing, information-sharing, government and stakeholder engagement, and a number of other roles that serve to de-risk investment such as blended finance, policy, capacity building, and other Government-to-Government Assistance, revolving funds, proof of concept studies, geological assessments, subsidies for positive health and environmental, convening power, entrée to financial instruments. How can civil society organizations contribute? Civil society organizations can assist in identifying candidate sites by identifying areas where mercury reduction would be most impactful or strategic. NGOs can provide guidance on the metrics by which investors can measure the social, economic, and environmental impacts of their investments – Identification of metrics for “success”. How do artisanal gold supply chains work? Artisanal miners may work alone, but they more frequently band together into organized groups, with varying degrees of formality and negotiation power within that arrangement. These groups generally sell their production to a trader in a market environment, where they can sell to whichever trader offers the best price. Traders can aggregate production from many groups, and then explore their own options for selling to the highest-bidding exporter, who then sells to refiners. Trade relationships all along the supply chain are generally based on singular transactions, rather than long-term sourcing arrangements. But many variations exist and trading relationships can be customary or long-standing in some cases. Why is formalization of the ASGM sector important? It’s more likely to see success and reduce negative impacts on local populations. What guides or tools have you authored?